This had a potential to be a great film, the swansong of an aging auteur. It has a revenge-seeking story well-suited to Eastwood’s simple directorial style and to wrestling with his on-screen persona; it has a terrific cast on paper; it has a strong sense of place. 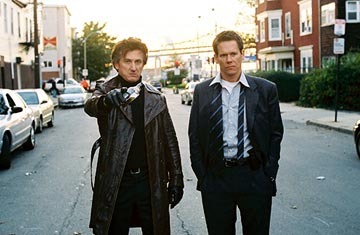 But MYSTIC RIVER isn’t a great film, for two very specific problems — the acting and the script. OK, that was a cheap shot, but the two central actors and the story structure prevent the film from being what it could have been. Sean Penn plays an ex-con and neighborhood boss whose daughter is killed, and he’s competing with the cops to find out whodunnit and then — well, take something other than warrant out on them. Penn’s performance is mostly pretty good — intense, brooding (there’s a particularly fine scene where he’s looking at some guys he doesn’t like in a convenience store). *But* … there are a few moments, like the scene you might have seen in the trailers when the cops have found his daughter’s body, when he goes wildly over-the-top with the tortured-soul screaming act (for a whole movie of Penn doing what I’m talking about, see HURLYBURLY — or don’t, if you get my drift). But even if you like this style, or Penn doing it, it’s completely wrong for a film this clinical, this objective, this coldly functional in its style. Now Penn merely makes a few missteps, but it’s just a few loogies in the punch bowl. Tim Robbins, on the other hand, is all loogie — nothing short of dreadful as Penn’s childhood friend who was sexually abused (by a Catholic priest, of course, though so little was made of that after the first scene that I suppose I should be grateful in this environment). Dreadful. Awful. Thumpingly awful. Jaw-droppingly awful. In fact, I can’t think of a more consistently and thoroughly bad performance in a high-prestige picture by an actor we know can be good or great (“Arlington Road, The Shawshank Redemption, The Hudsucker Proxy, Short Cuts, The Player, Bull Durham,” I recite like an exorcism prayer, warding off evil spirits). In MYSTIC RIVER, though, Robbins is borderline autistic. It’s like he is playing a parody of shell-shock — there’s Post-Traumatic Stress Disorder in his every mannered gesture, every low and carefully-said word, every heave of the shoulder. It’s awful, awful, awful, and it sinks the movie every time he’s on screen. Still, there’s a lot to like here — Kevin Bacon and Laurence Fishburne as the cops show up the two showboating stars with their naturalistic, unhistrionic performances. They just confidently inhabit their roles, as Eastwood used to (Bacon has never been better IMHO). Marcia Gay Harden is obviously playing Harried and Worried Wife, but doesn’t overdo the tics like Robbins does (Timmy on SOUTH PARK doesn’t overdo the tics like Robbins does). You see in Harden’s eyes how she’s trying (and sometimes successfully) not to be Harried and Worried. In the great opening scene some boys play on the street until the life-defining event suddenly enters. It’s creepy, suspenseful and told with the camera unostentatiously at a suitably low child’s-eye view, looking up guiltily at the authority figures. The final moments (I will be vague again to avoid spoilers) — of Laura Linney and Penn, looking out on a parade, and she talks, and then the parade, and some other things happen, are nothing short of perfect. The coda has an eerie ambivalence, where everything means double, that you half-suspect the characters both know and not know, which is exactly how this kind of revenge film should end.